The WATCHMAN implant device is an innovative device for stroke risk reduction for patients with non-valvular atrial fibrillation who have issues with blood thinners. Here at First Coast Heart & Vascular Center, our physicians perform this procedure at Memorial Hospital in Jacksonville, Florida. The WATCHMAN Implant device for AFib treatment gives patients a cutting-edge stroke-risk reduction option other than typical blood thinners. 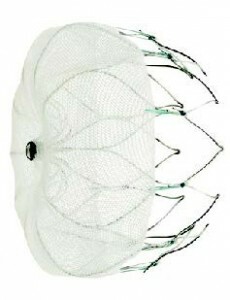 The WATCHMAN device is an acorn-shaped device that is implanted in the left atrial appendage of the heart in order to permanently close off this small area of the heart. More than 90% of clots develop in the left atrial appendage and can cause a stroke in patients with atrial fibrillation. The WATCHMAN device is a one-time implant normally performed under general anesthesia. Just like a stent procedure, the physician will guide the WATCHMAN Implant device into the patient’s heart through a catheter inserted through a vein in their groin. The implant does not need to be replaced in the future and does not require open heart surgery. Device placement requires crossing from the right side of the heart to the left side of the heart through a transeptal puncture. After the position has been confirmed, the device is implanted and left to heal, becoming a permanent door to seal the left atrial appendage, preventing clots from forming there. The patient will be required to stay overnight in the hospital. Recovery time is usually about twenty-four hours. Warfarin is required after the procedure until it heals well. After 45 days, most patients are able to discontinue taking warfarin. This procedure is FDA approved. Atrial fibrillation (AFib) is a common heart condition where the upper chambers of your heart (atria) beat too fast and with chaotic rhythm (fibrillation). This condition can cause blood to pool and form clots in an area of your heart called the left atrial appendage (LAA). If a blood clot forms, it can travel through an artery to the brain and cause a stroke. Atrial Fibrillation (AFib) is a very common abnormal heart rhythm where the upper chambers of the heartbeat with an irregular rhythm. AFib increases the risk of stroke for these patients over time. AFib affects over 5 million Americans. Roughly15-20% of all strokes arise in patients with Afib and approximately 90% of the clots causing stroke in atrial fibrillation come from the left atrial appendage. Strokes that are caused by AFib are usually more serious than other causes. Currently, Coumadin and other anticoagulant blood thinners are the most common treatments to reduce stroke risk in patients with AFib. Coumadin is not well tolerated by many patients and causes a substantial risk of bleeding complications in many patients. Almost half of AFib patients are untreated because they do not tolerate Coumadin. WATCHMAN gives these patients a cutting-edge alternative to Coumadin for stroke risk reduction. If you would like to learn more about AFib and treatment options to decrease your risk of stroke and to learn about the WATCHMAN Implant device, please call 904.423-0010 to make an appointment. Specific information about the Watchman Implant device is also available at http://www.watchmanimplant.com.